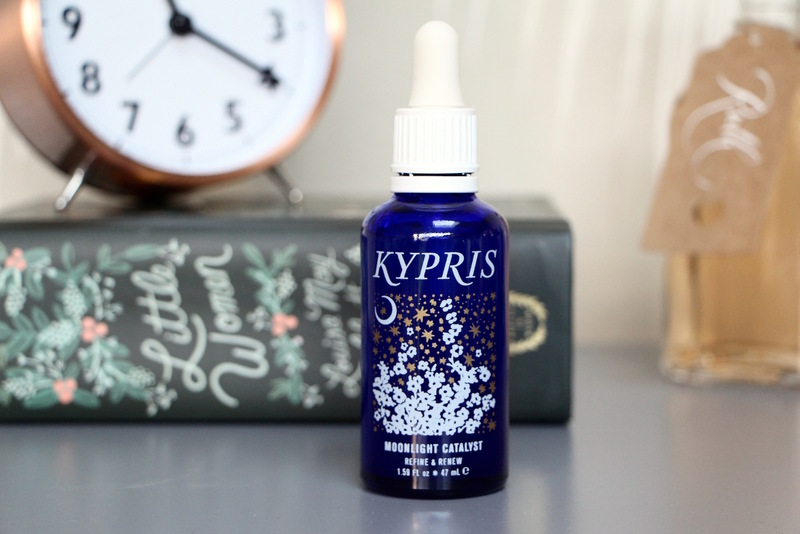 I mentioned the Kypris Moonlight Catalyst in my post about powerful, pregnancy-safe beauty products, but since then I’ve given it an even more thorough testing and I must say that the results are very convincing. It’s a lightweight, watery serum (nothing like the rich, creamy serum I reviewed in my previous post) that absorbs quickly and completely into the skin, and despite the name (and packaging) suggesting a product that might be a bit on the “gentle and dreamy” side, it’s actually a very effective exfoliant. The big player in the Moonlight Catalyst is the enzymatic exfoliant, which is pumpkin-derived. (One of my favourite fast-acting face masks also stars this exfoliant – Peter Thomas Roth’s Pumpkin Enzyme Mask, see review here.) The exfoliant smooths and brightens the skin (great if you’re continually knackered and grey-hued) without the harsh, abrasive action of a manual face scrub, but the serum has also been formulated with some powerful anti-oxidants, skin-reparing vitamins and moisture-boosters so that your skin gets one almighty big overhaul while you’re sleeping. Now I’m no stranger to acid exfoliants, but never have I been able to tolerate one this effective whilst pregnant – usually if they’re strong enough to make a visible difference, they’re too strong for my skin and I get redness around my nose or on my chin, or I get breakouts. Kypris Moonlight Catalyst didn’t leave any redness, there were no breakouts and, in fact, my skin felt and looked calmer and more balanced. No tightness or uncomfortable stinging sensation, just really bright and fresh skin the following morning. It was a bit of a trouble-shooter, a few times, magically sorting out spots and dry patches and dullness all at the same time! I’m afraid this is another pricey serum, though you do get almost 50ml rather than the 30ml offered up in most serum bottles. Moonlight Catalyst is £74 at Cult Beauty here* – it’s actually far cheaper, millilitre-for-millilitre, than Sunday Riley’s Good Genes, though not nearly as eye-wateringly potent. I can’t touch Good Genes when I’m pregnant or breastfeeding, even with someone else’s bargepole, not least because hormones make it smell like stale cat’s wee. Moonlight Catalyst, then: great for those who want renewed, rejuvenated skin overnight, who want effective ingredients that repair and protect as well as brighten and who perhaps want the hit of a serious “anti-ageing” product without worrying about the retinol/pregnancy issue. (Read about that here.) Also a nice alternative to the glycolic acid-based exfoliants out there, if you don’t get on so well with those. Next Post Benefit Brows: An Incredible Instagram Giveaway!